In the same way as your football team's shirts can each hold connotations of a period of your life, happiness or sadness, success or - dare we say it - failure, so can the history of matchballs. Since Mexico 1970 and the advent of the first World Cup televised in colour, adidas have always been the top dogs in creating spherical masterpieces. 12 black pentagons and 20 white hexagons screams Pelé and Brazil and every four years since there has been another released to whet the appetite for the forthcoming showpiece. From the continuation of the Telstar through the 70's, via the uber-iconic Tangos (can any piece of manufacturing history be of more need of a re-release?) full circle to Mexico '86's Azteca and beyond. If you can find an Azteca with chubby knuckle marks then fear not ye any global economic meltdown. The same goes for a Geordie-tear-stained Etrusco from Italia '90. These balls are not purely functional. Each tells a story of a team, a player, a country. Into the nineties the ball evolved at increasing speed. The Azteca which had morphed into the Etrusco in turn became the Questra in USA '94. A nice ball albeit less classic in design. My own replica I still remember: White with pink detail but not an ounce of shame was felt. By now for both World Cups and European Championships the balls were detailed and specific to the home country and in Euro '96 adidas took football home with a superb three lion-ed version of the Questra. More recently adidas footballs have been even more adventurous. Let's not forget the Champions League ball and, well, even doing our best to forget the latest African Nations Cup offering, no one can accuse the manufacturer of lacking innovation. But whatever the advances in technology, however lighter the balls and however much Nike-endorsing goalkeepers will bemoan the increasing unpredictability of flight, from Euro 2008's Europass we can see that the oldest designs, rightfully, die hard. The Tangos were some of the best ever. Loved those. I\'ve said before, I think every match should be played with the tango. Bring back the Tango\'s - Adidas balls post France 98 have been awful. oh how much i love the Tango!The first I ball I can remember when I was a child..<br />I think the best version of the tango design is the Etrusco one.<br />Roteiro is the worst adidas ball I have ever seen on a football ground, even if the really wrost I ve ever seen is Diadora\'s Janus AS Roma versione.. half orange half red.. <br />[url]http://www.asromaultras.org/Pallone_janus.jpg[/url] impossible to see it..
Look at the 14 panel construction of the Europass, and you can see how easily the Tango design can fit that construction, what are Adidas waiting for? Looks as though it was re-released:<br /><br />http://shop.subsidesports.com/uk/a-72057594037939836/Adidas+Tango+Pasadena+Football<;br /><br />But a Tango ball should ALWAYS be on sale. I also want my white and pink USA \'94 Questra back. tango is a classic design. I didn\'t forget it. 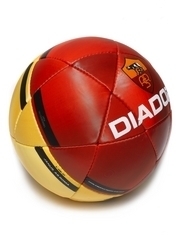 \"Let\'s not forget the Champions League ball...\"
SÃ¼per olmus !<br />This is a great ex. i love the tango. bring it back for use in top level games please adidas! !